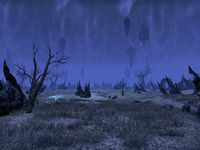 This overlooked acreage atop a floating plateau in Molag Bal's Oblivion realm of Coldharbour is available to be developed however you like. It's a secluded location, very quiet and private, even scenic in its own austere way. The Coldharbour Surreal Estate is a large player house located in Coldharbour. Much like the name suggests, its a piece of real estate without any buildings or structures present. The property is accessible through a portal located just outside the Hollow City which transports you to where the property actually is - floating above the chasm to the east of Grunda's Gatehouse and north of Daedroth Larder. At present, it is not known whether there is a fully furnished version of this home available, though even in its unfurnished form it has more items than any other unfurnished home when initially purchased, enough to earn you several achievements immediately. It became available for purchase following the 2018 Jubilee Event, and requires the The God of Schemes achievement in order to purchase. Apprentice Decorator 5 Decorate a home you own with at least 50 objects. Journeyman Decorator 5 Decorate a home you own with at least 100 objects. Conservatory Decorator 5 Decorate a home you own with at least 100 Conservatory furnishings. Lighting Decorator 5 Decorate a home you own with at least 20 Lighting furnishings. The location of the inactive portal prior to Update 17. A mage and a fighter stood guard on the approach. This page was last modified on 3 February 2019, at 09:10.